If you’re looking at Holden Beach homes for sale chances are good that you’re going to have a move on your hands. Moving day can be something to look forward to with excited anticipation or with dread. The difference is in how organized you are ahead of time. If you have a company coming in to pack you up and move you, then this article doesn’t really apply to you. 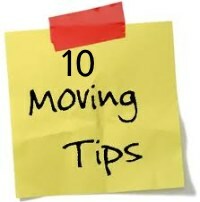 For the others, the one’s that are moving themselves or at least part of your things, these tips should help to make moving day go just a little bit easier. 1. Purge anything you don’t need, haven’t used, and probably won’t use in the next 2-3 years. That means throw it out, donate it, or sell it. 2. Get supplies. Collect boxes from stores or buy some from UHaul or UPS. Buy packing tape and get the tape gun, too. (It’s well worth the cost.) You’ll need large black magic markers for writing on the boxes. 3. Number and label boxes with what’s inside and what room it should be put into when it arrives at your new house. 4. Keep a notebook with the contents of your numbered boxes for ease in finding things after they’re packed. 5. Don’t bother packing clothing in the closets. Grab a handful on hangers and lay them down on a blanket. Wrap the blanket around the clothing to protect them and place on top of items in the moving truck. 6. Fill dresser drawers with lightweight pillows and blankets only then tape closed. 7. Beg, borrow or buy a hand truck or dolly. Your back will be so grateful. 8. Store boxes packed early on the first floor if possible. 9. Beg, borrow or bribe some teenagers to help you. 10. Some people opt to hire a company to move their heavy items and then move the lightweight items themselves. If you’d like someone who knows the area to show you the available Holden Beach homes for sale we’d be happy to work with you to make your home purchase and move go as quickly and smoothly as possible.